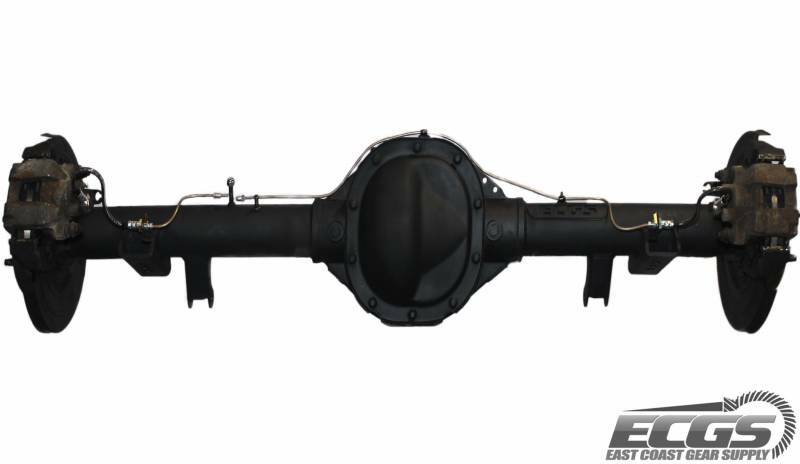 Ford 8.8" rear axle assembly ready to bolt into your Jeep YJ off-road vehicle. Please read our Jeep FAQ Page for all questions related to Jeep complete assemblies. 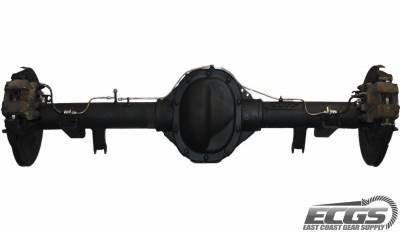 A great 8.8" rear axle upgrade for your Jeep YJ. Don't waste money rebuilding your Dana 35 axle or upgrading it when you can replace it with this bolt in Ford 8.8 axle complete assembly. It is Factory width with the same lug pattern. It Also Comes with Disc brakes, and has E-brake shoes built into the Rotor assembly. Compatible with your Jeep with new E-brake cables. The Jeep YJ Spring Perches are already welded on so you will easily be able to bolt in this axle assembly. You can choose exactly which options and upgrades you want for your new axle assembly. Base price includes Ford 8.8" rear axle assembly with Jeep YJ Spring perches and shock mounts welded on, new HD U-bolts and U-Bolt Plates, w/empty center section but includes Used: axle shafts, carrier, yoke and all used brake hardware. ** All Axle tubes will be welded to insure they will not spin** Re-gear and bolt in. Or select from factory Gearing options for a minimal charge with and without factory limited slip. You can also choose to let us freshen up the factory axle with new differential bearings and axle bearings. Or you can choose to have us rebuild the axle to your specifications. By selecting the Gear ratio option, you will be choosing our remanufactured unit which will come with New axle bearings and seals, New ring and pinion, and New differential bearings. All of our remanufactured units come with a five year parts and labor warranty. The Best warranty in the Industry. (Lockers carry manufacturers warranty only) (36" Tire Limit on F8.8) The handling fee is to cover Freight Shipment anywhere in the country. These Units ship free otherwise. NO HANDLING FEE IF PICKED UP AT OUR LOCATION. LOCAL TAX OF 7.25% WILL APPLY HOWEVER.